The art in Revival doesn’t so much catch viewers’ attention as it assails them into acknowledging it. At the main entrance is an enormous video projection of a two-year-old smoking. During a 19-second loop, he lifts the cigarette to his mouth, withdraws, and blows smoke rings right at the camera. At one point, the camera zooms in so close that the boy’s mouth fills the entire screen. Revival is the first in a series of shows celebrating the National Museum of Women in the Arts’ 30th anniversary, and it highlights a shift in the museum’s approach since it first opened in 1987. Back then, it focused heavily on highlighting female artists of the past who’d been left out of art history. That’s still a big part of the museum’s mission, but in recent years, it has shifted its focus more toward championing contemporary artists. In that spirit, Revival showcases 16 artists, 15 of whom are living. The common theme among their work isn’t a set of ideas or emotions, but rather the intensity of the reactions they trigger in the viewer. The featured sculptures, photography, and videos overwhelm the senses with their almost painful explorations of feelings like love and fear. And like the sweaty, old-school church revivals that partly inspired the exhibit’s name, this show is not here to make you feel comfortable. Marshall isn’t the only artist in the group who explores how adults project their anxieties onto young people. The pale adolescent girls in Anna Gaskell and Deborah Paauwe’s photos look menacing, or maybe even inappropriately sensual. As with the 2008 controversy over a portrait that Annie Leibovitz took of 15-year-old Miley Cyrus for Vanity Fair, they raise the question: Are these girls being sexualized, or are viewers just unloading their own adult baggage onto them? Or, put it another way: If there is a problem here, could that problem be you? There are also several images of inverted women in the exhibit, the most powerful of which is a statue of a naked black woman with antlers (a male adornment). She is suspended from the ceiling by a rope around her ankles, and the effect is striking—and disturbing—for its resemblance to a lynching. But that isn’t the only thing artist Alison Saar had in mind when she made it. Near the statue, another sculpture by Saar of a decapitated woman’s head lies on a raised, rectangular pedestal. The woman’s hair hangs over the edge, tangled with the irons that she (presumably) tried to straighten it with. Now, in a grotesque reversal, her head appears to be the thing on the ironing board. 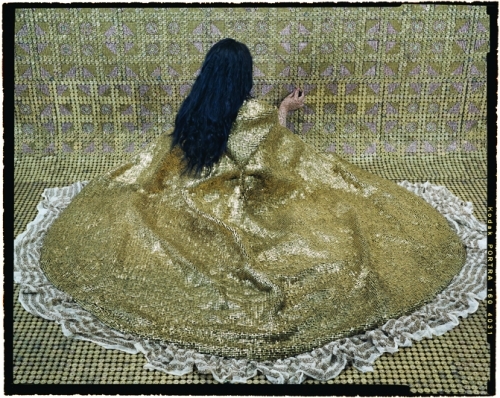 Two of the most subversive pieces in Revival are from Arab artist Lalla Essaydi’s Bullets Revisited series. The photos are eerily reminiscent of 19th century Orientalist paintings that fetishized Arab women through a Western gaze. In Essaydi’s images, her female models are adorned with and surrounded by intricate patterns of golden bullet casings. These bullets evoke the violence that Westerners often imagine is inherent in Arab and Muslim people. But they also draw attention to how actual violence in the Arab world—which attracts less Western news coverage and sympathy than attacks in France or the United Kingdom—can be at once visible and hidden. Just beyond Essaydi’s images is a sculpture so disconcerting that the museum consciously placed it in a tiny room by itself. “The truth is, it doesn’t play well with others,” says Kathryn Wat, the museum’s chief curator. The piece by artist Patricia Piccinini is of a mother and her four babies, all of whom look kind of like human-pig hybrids. The creatures are realistically grotesque, and their hair even comes from human heads. The piece, like much of Piccinini’s work, is concerned with whether human empathy will be able to keep up with our own biotechnical advantages (visitors may be reminded of the recently invented artificial womb). Through her work, Piccinini asks whether we will be able to accept the creatures we create, no matter what they look like. Frankly, it seems an irrelevant question. The thriving white supremacy and Islamophobia in the United States and Western Europe shows that humanness on its own is not enough to engender empathy (and if you need a reminder, just go back and look at Essaydi’s work). Still, Piccinini’s sculpture feels appropriate in the show. Like the other pieces in Revival, it’s so extreme that it forces you to have a feeling about it, even if that feeling is wanting to crawl out of your own skin.